If you're feeling gutsy, try this with your users. If you're not ready for that, think of some other places you could map (or just stick with your library) and try it out with colleagues. Have three minutes? Draw me a map of the library. Every sixty seconds, switch to a different colored pen (for instance: use red for two minutes, then green for two minutes, then black for the last two minutes). Note: Try to keep this consistent for everybody who draws a map. This way, you can color-code immediate ideas and last-minute thoughts. 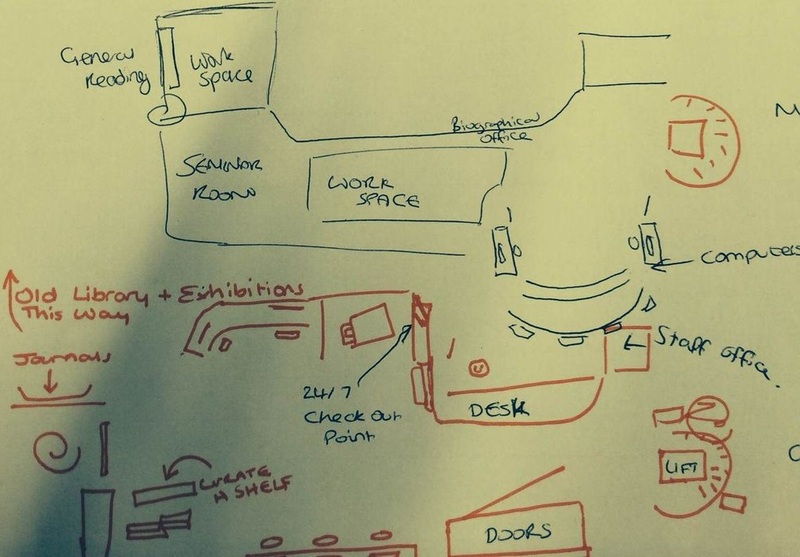 Example library map from a student in the UK. What's most noticeable to them? What do they use first (or most often)? How do they interact with (or ignore) certain resources?